With over 101 individuals seeking municipal office for October's municipal and school board elections this October, the question that now comes to mind is why are there so many candidates seeking office? More importantly, why has this number been growing over time? After all, in 2000 only 76 candidates sought office. 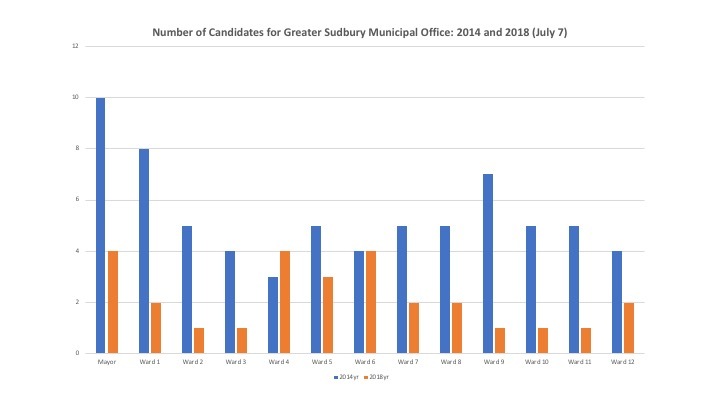 While there have been some ebbs and flows in numbers since then - there was another surge in candidates in 2003 - it remains that particularly since 2006, the numbers seeking the Mayor's job as well as an At-Large Council position have grown steadily. Yet the overall population of the City is flat. 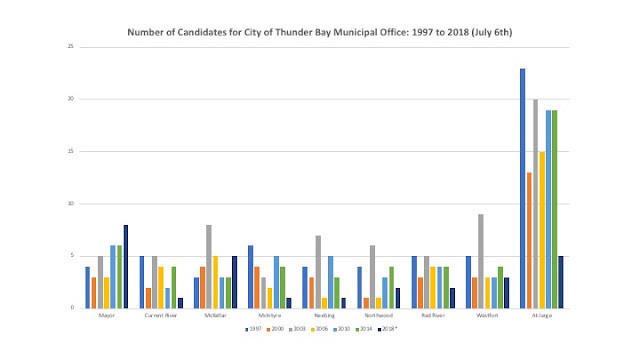 The municipal election process in Thunder Bay culminating this October is starting to pick up steam and there are now two candidates in the running for mayor: Iain Angus and Larry Hebert. Both are long time stalwarts of Thunder Bay City Council and have contributed years of valued service to the community in assorted capacities. Both also topped the polls last election for the position of Councillor at Large with Angus at 15,861 votes and Hebert at 14,664. Given that the two top contenders for the Mayor’s Chair last election came in at 14,463 (Keith Hobbs) and 12,051 (Ken Boshcoff) votes, they are certainly credible contenders for the position of Mayor. Of course, when one looks at the current composition of City Council, there is indeed an embarrassment of riches when it comes to potential candidates for Mayor. It is always time for a female Mayor in Thunder Bay and given Rebecca Johnson’s sterling career of community service, one would expect that she would also consider a run for Mayor. It would be credible given she garnered 14,620 votes last election in the At Large race. Frank Pullia has carved out a strong role both as an advocate for community causes as well as a strong showing in the finance portfolio at City Hall. At 14,112 votes last election, he is a key contender. And of course, who can forget the ubiquitous Aldo Ruberto whose passion for quality of life issues in Thunder Bay plus 14,311 votes in the last At Large Race also puts him within reach of the Mayor’s Chair. There are also some strong candidates in the ward Councillor category – the names that particularly come to mind are Joe Viridiramo and Andrew Foulds. They are both high profile candidates committed to their city and with exposure across the community. Of course, they cannot all be mayor but being the Mayor in Thunder Bay is important given the need for a sustainable economic future that embraces all the people of Thunder Bay and the leadership role that Thunder Bay plays in the region. It is important to have as strong a slate of visionary candidates as possible to generate the ideas we need to move forward. This election is an opportunity for defining debates and visions in the areas of economic development, First Nations relations and social and urban affairs and what better way than a strong Mayor’s race with many quality candidates. It should be noted that the race for Mayor need not be relegated to current City Council incumbents. There are many individuals in Thunder Bay who also have strong community leadership credentials and it would be a shame if Ken Boshcoff or Shane Judge did not put their names forward again. Indeed, Shane Judge apparently will be running. It is also a shame that Lisa Laco has stated she is not running. And then there is the business community. Having someone prominent from our local business community step up would also bring a vital perspective to the municipal election especially with respect to issues of business development and taxation. This is a crucial time for picking Thunder Bay’s next Mayor and council given the many challenges that have faced our community over the last four years and that will continue in the future. We are also picking a Mayor who will be the public face of our community at an important milestone – the 50th anniversary of Thunder Bay’s creation that will occur in 2020. Having a strong mayor’s race full of vigorous visions would be the ultimate community contribution our community leaders could make. Having a strong slate of candidates for Mayor would be a vote of confidence in the importance of municipal politics in Thunder Bay and the importance of civic leadership in shaping our future. It is time for our accomplished community leaders to step up to the leadership challenge and run for mayor.